Get the TOP DOWNLOAD, TOP RATED app for Microsoft Band, NOW AVAILABLE for Windows Store! ...now with support for iPhone and Android users! Are you a sports fan, racing fan, or old-school arcade fan? Are you an alumni of the greatest college or university in the world? 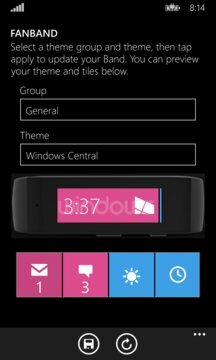 Love to brand and theme your Microsoft Band experience to show your pride? There are over 2,000 awesome themes now available, but if you have one you'd love to see, be sure and request it from within the app! 2) YOUR MICROSOFT BAND TO BE PAIRED DIRECTLY TO YOUR WINDOWS 8.1/WINDOWS 10 COMPUTER. 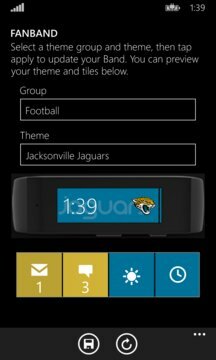 IF YOU DON'T HAVE A PAIRED WINDOWS PHONE WITH FANBAND INSTALLED, OR A DIRECT BLUETOOTH PAIRING (for iPhone and Android users) ON YOUR COMPUTER, YOU WILL NOT BE ABLE TO UPDATE YOUR THEMES. NOTE: Custom Theme Designer may have issues if you are running at anything other than 100% scaling. For example, running at %150 scaling will skew your results.